A Big YES To ART EVERY DAY! At Young Scholars Academy, we incorporate art into our daily curriculum to help facilitate comprehension of the varying ways art can be applied. Did you know a whole curriculum can be centered just on one piece of art? Although Spring has officially ended, the kids were so interested in all the types of bugs they were finding on the playground and ESPECIALLY the bees they found near the greenhouse we have on the playground! 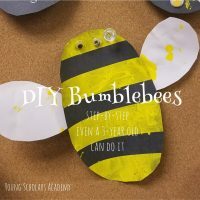 The Pre-Kindergarten class decided one afternoon to make their own bumblebees, but the teachers ensured it was something just for them, and something they could just do! Crafts, which typically are very teacher-directed, don’t have to be; you can help kids do it all themselves! 1. Have the kids cut out their own oval. Find an oval shape to help guide them, prepare yourselves for a shape that will look nothing like an oval! 3. Have children paint over the whole taped area, then allow paint to dry. 5. Additions you could do are googly eyes, wings, pom poms for the bumblebee fuzz effect etc. Tada! Just goes to show that any everyday experience can turn into a learning lesson for the kids. Let them do it themselves as much as you can; their sideways artwork will one day be something you look back on and get teary eyed!